Welcome to Homecoming Week 2018! We are excited to welcome our Wildcats home as we come together to celebrate the FVSU tradition. In particular, we always enjoy the return of alumni who are connecting and reuniting with classmates as they reminisce about their days as students and continue to support the institution. We are particularly pleased to welcome home the Class of 1968 as they celebrate their 50-year reunion, a tremendous milestone we look forward to commemorating with them. Just as important, we encourage students to continue to create their own wonderful Wildcat memories. If the Gospel Concert and Kick-off, which occurred earlier this week, are any indication, this promises to be one of the most extraordinary Homecomings ever. This year’s Homecoming theme, FVSUnited, perfectly reflects what it truly means to be a member of the Wildcat Family. Throughout my nearly three-year tenure, I have been impressed with how we have united to build and strengthen our university community. Our unity is imperative as we continue to navigate the current higher education landscape and build the “college of the future” upon a foundation of excellence. This week, we recommit ourselves to that endeavor. Whether you are celebrating your first-year as a student, your senior year, or participating in one-year, 10-year, 20-year, or older class reunions, there is something planned for everyone. We know you will enjoy the many activities. As alumni return to campus, we hope they will learn of the forward progress we are achieving together, including our recent new ranking by US News and World Report as the number one public HBCU in Georgia. We also hope that everyone will enjoy the new energy on full display from the Blue Machine Marching Band, which is getting national attention, and of course, cheer our Wildcat Football team on to victory. Alumni will no doubt notice the physical changes we are making to the campus. We have made progress on the demolition of the old dormitories. We invite them to visit the historic quadrangle area where they will find a new fountain, a refreshed Hunt-Bond-Troup Memorial, and a new garden paying tribute to our sister historically black colleges and universities. Patton Hall, home to the FVSU Blue Marching Band, also underwent renovation this summer, and Bishop Hall will soon reopen as the new home to the Media Studies department. Earlier this month, we opened a new Georgia Room in Hunt Memorial Library, which now also features a new 24-hour computer lab and Jazzman’s Café. Plans are underway for the renovation of the Dining Hall and Lyons Hall, which will become home to a new one-stop enrollment management center. As we finalize our master plan, we are excited about the future of FVSU and our refocus on excellence and student success. As we kicked off the Homecoming activities with the FVSU Annual Gospel Concert Sunday evening, I could not have been more inspired and spiritually nourished by the awesome performances of FVSU’s Dance Ministry, Faculty and Staff Choir, Concert Choir, and the Voices of Faith Choir. These amazing performances were a great way to kick off the week of celebration. 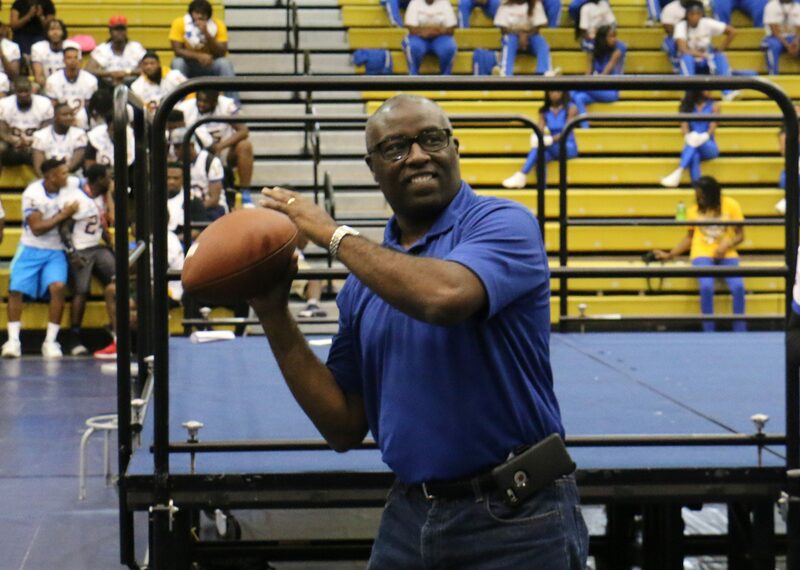 I invite you to take advantage of the rest of a week filled with activities, which may be found at www.fvsu.edu/homecoming. Thank you for your continued support of your Alma Mater. And, a special thanks to you for your trust and ongoing love for FVSU. Because of your love and spirit of unity, we are making great progress in raising a culture of philanthropy and student success. Let this week be a celebration of both our extraordinary history and our continued work together.